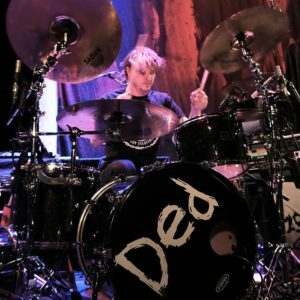 Ded is a fairly new metal band hailing from Tempe, Arizona consisting of lead singer Joe Cotela, guitarist David Ludow, bassist Kyle Koelsch, and drummer Matt Reinhard. Right now they are touring with New Years Day, P.O.D. and In This Moment. An amazing foursome who put on a show that you will kick yourself if you miss. I was lucky enough to catch them in my hometown of Louisville, Kentucky on Saturday, Feb. 3rd. at the Louisville Palace and was even luckier that guitarist David Ludlow was gracious enough to take time out of his busy schedule to chat with me. I asked him how 2017 went for Ded as a band and he said it was “like a whirlwind”. 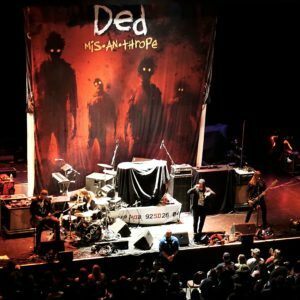 Their Album, Mis-an-thrope, dropped in July and David said the response for it is has been “crazy insane”. They just came off being on Shiprocked to join the bill with In this Moment so I asked if he preferred the large festivals or the smaller venues. He loves them both. I think he just loves being on stage! He loves the smaller venues because he loves to see the people singing along, sweating and crowd surfing to the front, but he loves the big festivals because the “roar of the crowd is infectious”. As of right now David says they have no plans for the studio. Studio time is not something you can plan. They are writing songs, as he puts it, they are “addicted to writing”. When the right songs come along they will get them recorded. But don’t worry, he says they have about 25 or so songs right now. 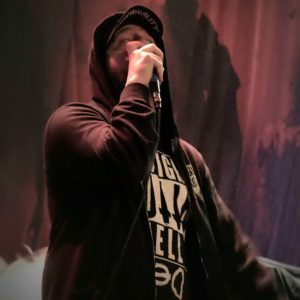 I asked David to pick a favorite tour memory from this tour and he loves that after a show, Maria Brink, lead singer from In this Moment, came back to tell them they killed it out there. 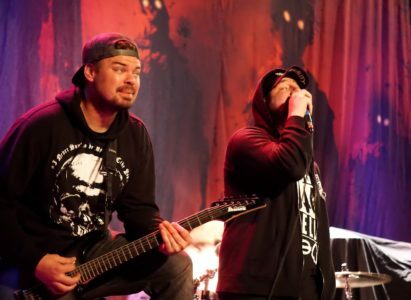 They will be on tour again in April with In this Moment and he loves that a band like that would take them under their wing and say, “Hey we want to present you to the masses and introduce you to our fans”. When David is up on stage he wants to inspire “positive aggression” and people being powerful for themselves in a respectful way. So get yourselves to a Ded show and create some positive aggression. Do it for them, do it for yourselves, you won’t be disappointed. Tagged DED, In This Moment, Louisville Palace.